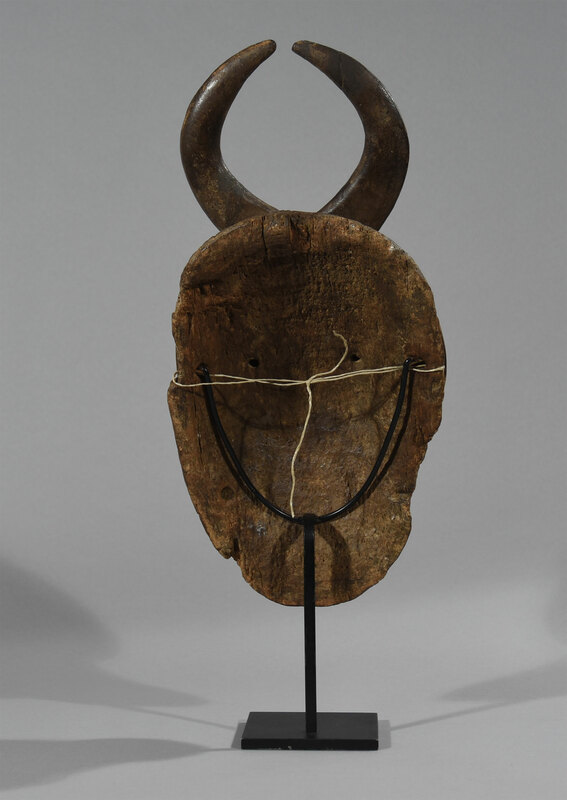 This old, antique mask was created by the Baule people of Ivory Coast. 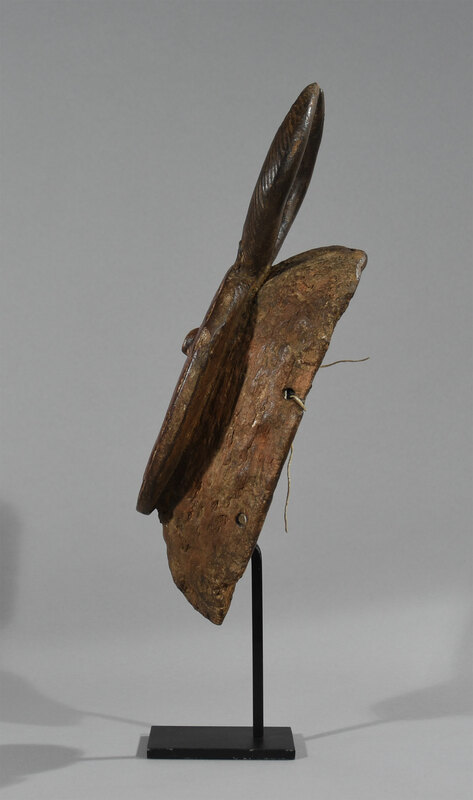 It is a very minimalistic mask carved from wood around the end of the 19th Century. There are two small triangular holes cut which enable the wearer to see. 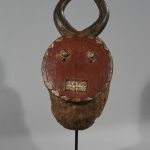 The rectangular mouth is very common among this style of mask. The red coloring emphasizes that it is the ‘female’ part mask. 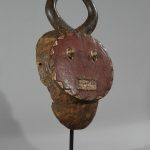 The circular face represents the life-giving force of the sun, while the horns symbolize the great power of the buffalo. 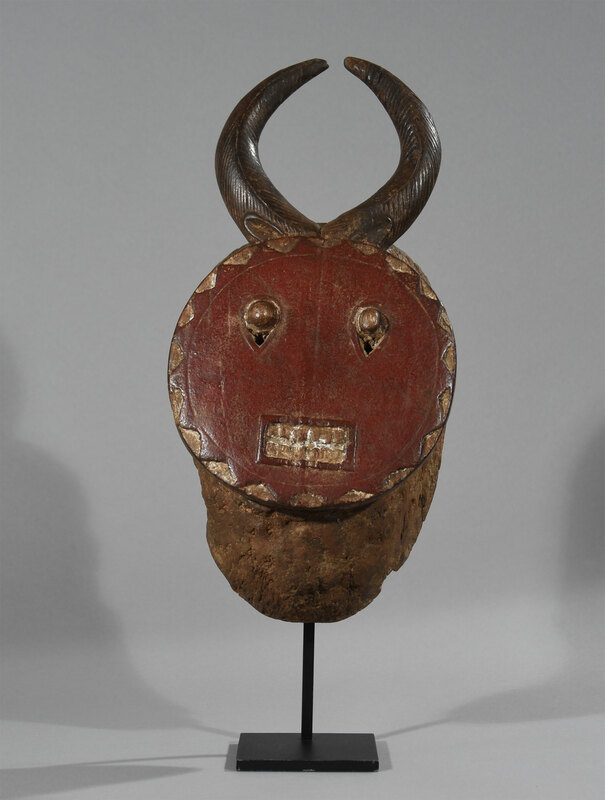 In the rich beliefs of the Baule, the buffalo mask symbolizes a divinity in which women are not allowed to see. 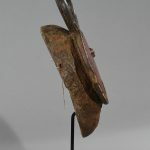 This particular mask can be seen danced during harvest festivals as well as Goli, a day-long spectacle that normally involves the whole village and includes the appearance of four pairs of masks, music played on special instruments, and, ideally, the joyous consumption of a great deal of palm wine. The Goli masquerades involve three rituals during the day; dawn, afternoon and after sunset. Kple kple masks appear at dawn and again briefly during the evening to announce the arrival of Goli Glin, a zoomorphic figure or a kpwan, an anthropomorphic figure. 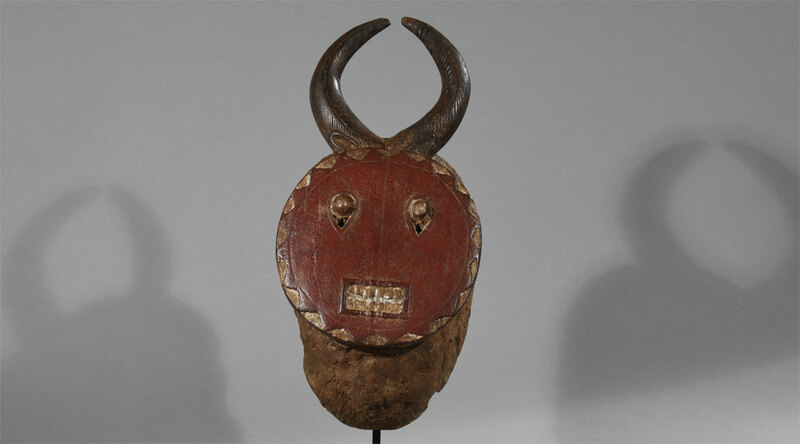 The mask wearer mediates with supernatural forces during the ritual, which have a positive influence on the village people. 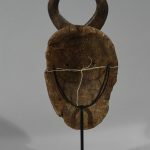 During the festivities, the young mask wearers are often draped in goatskin that covers their back along with a raffia skirt. 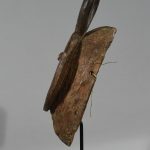 The mask is attached to the costume with vegetable fibers. The Goli dance ceremony is usually danced in pairs, four such pairs may appear in a single dance ceremony which can last all day in the Baule village where the event occurs. That event could also be a funeral or just a visit by an important national figure. 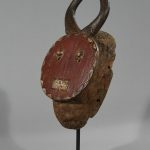 The superb sculptures of the Baule people of the Ivory Coast have long been recognized in Europe and the United States as one of Africa’s most significant art traditions. The work of many modern artists—Amedeo Modigliani in particular —reflects the direct influence of Baule invention and forms. Age: Est. late 19th Century. Conditions: Deep red patina with traces of black-and-white pigments, the condition is fine. In spite of age, there are no cracks only a few marks on the front. The backside, however, shows clear signs of wear after diligent use. Dimentions: H: 40, W: 20, D: 10 cm. 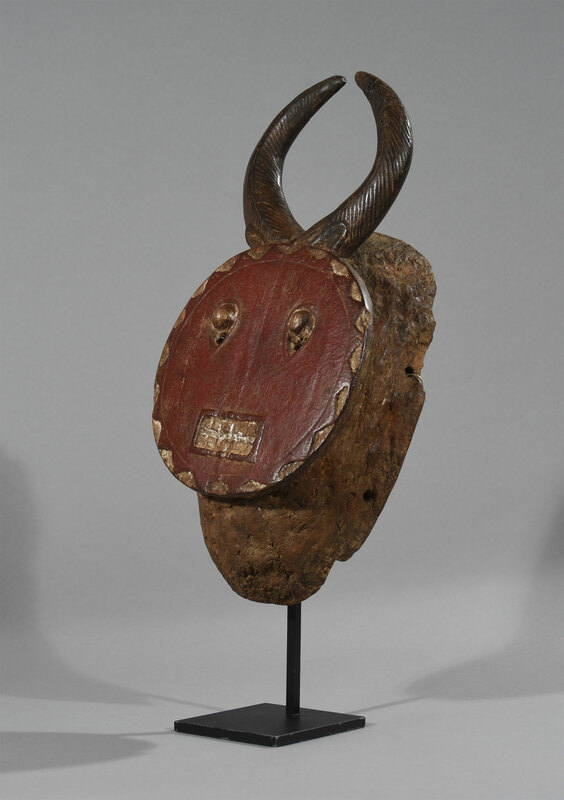 Literature: Susan M. Vogel, African Art Western Eyes, 1997.